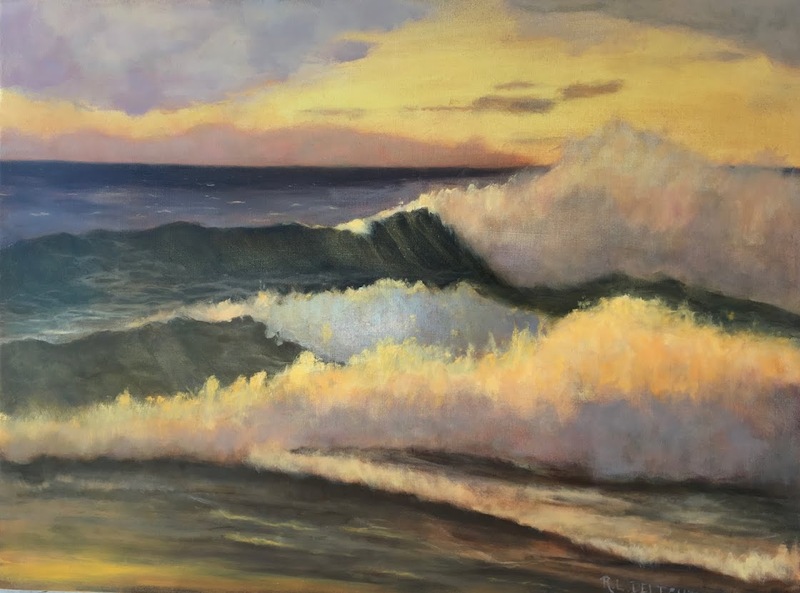 I have stepped up and publicly put an end date for my first 100 wave studies. I have until the end of August. I will be going on to another 100 marine studies after that. The marine studies will not only be of waves but rocks, beaches, seaweed, sea-life, birds. All things relating to the sea. The sea gets deeper under my skin with every painting and study I paint. There is so much to learn! The weather has been stormy. I didn't get out yesterday. The rain and wind was just a bit too much beyond the capabilities of my gear. I spent the day studying painting and seascapes. It was a lovely way to spend the day. I did get out on the beach for an hour to watch and observe. It was raining and blowing but watching is doable. Today the storms are marching north. There are great thunderhead clouds and squalls on the horizon but they are traveling northwest and I stayed warm and dry while painting. I did two one-hour-plus (10-20 minutes) wave studies. I could have spent an hour just painting the magnificent clouds! 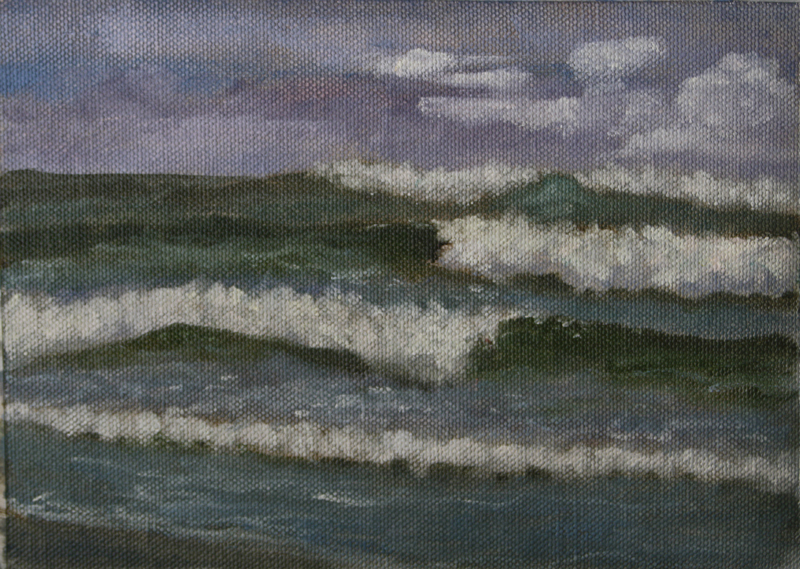 As it was, I rather hastily got them in and worked on the waves. ©2013 R.L. Delight, Wave Study #54, 6"x8", oil on canvas. 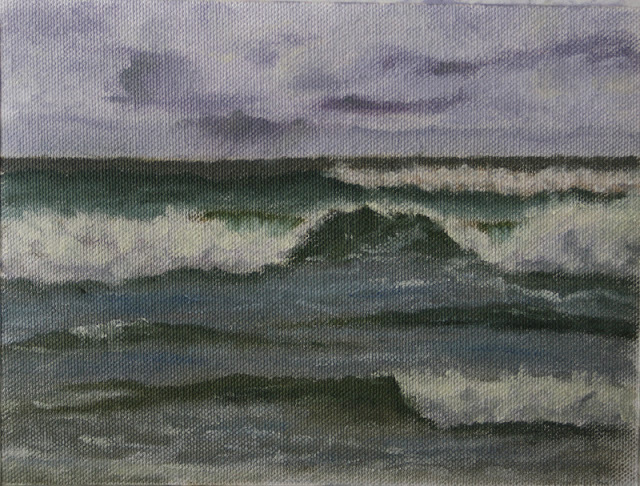 I decided to push myself to paint one hour or so wave studies. My goal is to be able to get enough information to paint a larger and more detailed painting in the studio. These wave studies really don't have much detail. The detail will come from many hours spent in observation, past, present, and future. I do not necessarily want to make larger copies of my plein air studies, although I have made a few, but use them as a starting point for my own compositions. I am trying a slightly different approach to how I proceed through the wave painting process. I am also trying different color combinations in my color mixing process. In addition I am working on different brush handling techniques too. Still so much to learn! This weekend I will be doing some much needed catching up on the domestic front. Have a good and safe Memorial Day weekend. I will also be honoring those who have served our country past and present.